My new project is the retrofit of an Emco Turn 120P CNC lathe. The original 5-phases stepper motors has been kept. They are driven by two Vexa UDK5128N drivers. Need 110V AC source for them, coming from an auto-transformer. The original spindle DC motor has been replaced by a 3 kW AC motor driven by an Hitachi NE-S1-022 VFD. 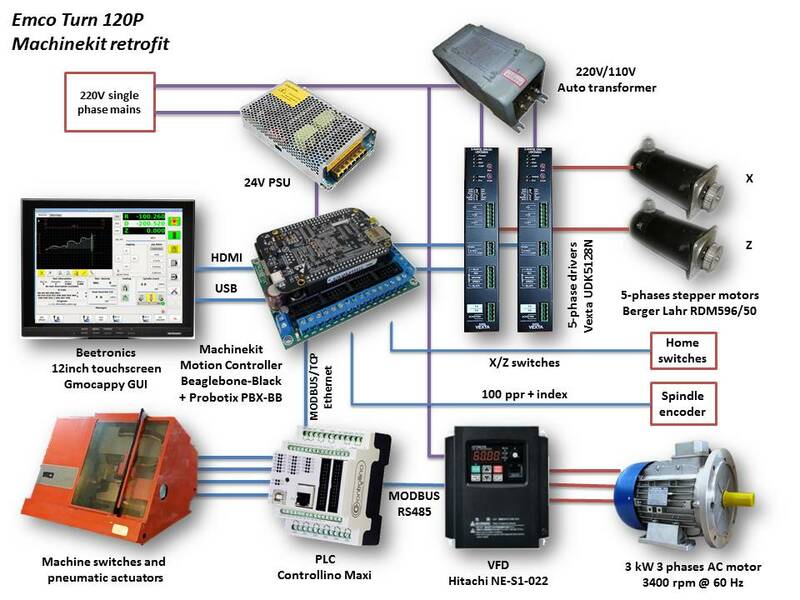 This VFD is controlled over MODBUS by the Machinekit controller through the PLC. I have patched the standard MODBUS over TCP stack to have a gateway to the RS485 bus. Here is the global schematic diagram of the electronics. Next step is the modification of the Probotix PBX-BB cape to give access to the eQEP2 quadrature encoder for the spindle position sensor. This entry was posted in Emco Turn 120P by f1oat. Bookmark the permalink.